In September, Opendoor Homes announced the practical completion of its development site at Elmshurst Crescent in Finchley. Tenants have now moved into most of the 13 homes at what is now called Gordon Court. 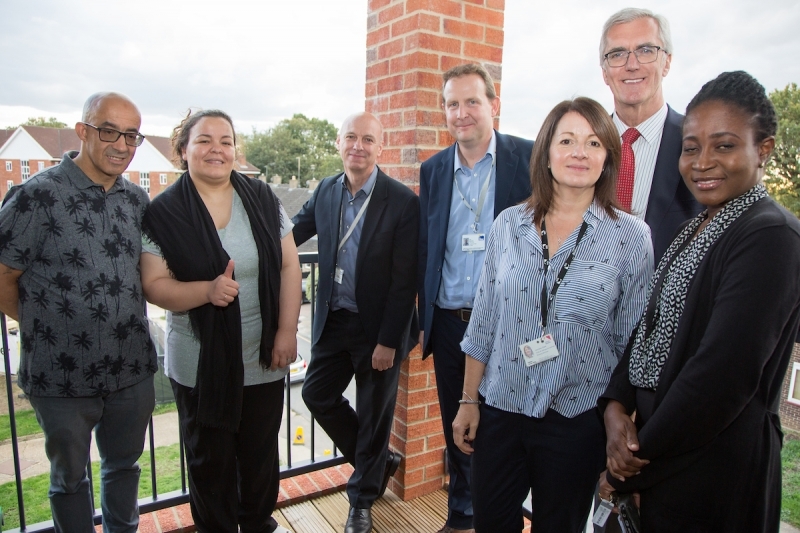 One of the families who have recently settled in received a visit from Barnet Council’s Housing Committee Chair, Councillor Gabriel Rozenberg. He was also joined by East Finchley Ward Councillors Arjun Mittra, Claire Farrier and Alison Moore. The Barnet Group’s Chief Executive Tim Mulvenna, Deputy Chief Executive Derek Rust and Board Member Jeff Baker represented OpenDoor Homes. Mr Zidi and his wife Mrs Messaouda spoke of their relief of moving to more settled accommodation after a period of living in temporary housing with their two young children. “Barnet is back in the council housing business. This is just the start of a programme of hundreds of homes across the borough being built and delivered in-house by Opendoor Homes.